6. Faceout Studio (Bend) is hiring a Graphic Designer. Salary: $38,000-$55,000/yr. 19. XRAY.FM (Portland Metro) is hiring a Radio Operations Manager. Salary: DOE. 23. Pacific Continental Bank (Portland Metro) is hiring a Technical Support. Salary: DOE. 33. Glen/Mar Construction, Inc. (Portland Metro) is hiring a Technical Support Coordinator. Salary: $15-$18/hr. 35. The Pew Charitable Trusts (Portland Metro) is hiring a Communications Officer. Salary: DOE. 40. Educational Service District 112 (Vancouver, WA) is hiring a Web Manager. Salary: $57,532.80/yr. 44. Adpearance (Portland Metro) is hiring a Marketing Specialist. Salary: DOE. 53. PHC Northwest (Portland Metro) is hiring an IT Manager. Salary: $80,000-$100,000/yr. 63. ZRT Laboratory (Portland Metro) is hiring a Junior Designer. Salary: DOE. 70. Funnelbox (Portland Metro) is hiring a Paid Media Specialist. Salary: DOE. 71. The Freshwater Trust (Portland Metro) is hiring a Communications & Outreach Associate. Salary: DOE. 75. Adpearance (Portland Metro) is hiring a Communication Analyst. Salary: DOE. 78. Midway LLC (Portland Metro) is hiring a Copywriter. Salary: $48,000/yr. 79. Midway LLC (Portland Metro) is hiring a Graphic Designer/Web Media Specialist. Salary: $52,000/yr. 81. Powell’s Books, Inc (Portland Metro) is hiring a Computer User Support. Salary: $18.75/hr. 90. Accompany (Portland Metro) is hiring a Data Quality Curator. Salary: $45,000-$50,000/yr. 96. Metro (Portland Metro) is hiring a Audio Visual Production Supervisor. Salary: $52,490–$76,111/yr. 1. Consano (Portland Metro) is seeking a Social Media Marketing Intern. Salary: $15/hr. 3. C+C (Portland Metro) is seeking a Public Relations Intern. Salary: $15/hr. 5. Downtown Oregon City Association (Portland Metro) is seeking a Salesforce and Database Intern. 6. World Pulse (Portland Metro) is hiring a Vice President of Technology. Salary: DOE. 9. Regional Arts & Culture Council (Portland Metro) is hiring an Arts Education Professional Development Specialist. Salary: DOE. 10. Regional Arts & Culture Council (Portland Metro) is hiring a Work for Art Campaign Assistant. Salary: $16/hr. 14. Adpearance (Portland Metro) is hiring a Project Coordinator. Salary: DOE. 16. City of Portland (Portland Metro) is hiring a Public Information Officer. Salary: $5,830-$7,784/mo. 19. Outside In (Portland Metro) is hiring an Electronic Health Record Specialist. Salary: DOE. 20. Shannon & Wilson, Inc. (Portland Metro) is hiring a Marketing Coordinator. Salary: DOE. 22. Oregon Senate Republican Office (Salem) is hiring a Communications Director. Salary: $4,500-$5,500/mo. 24. 3Degrees Inc. (Portland Metro) is hiring a Senior Director of Community Solar. Salary: DOE. 41. Multnomah County Circuit Court, Oregon Judicial Department (Portland Metro) is hiring a Data Analyst. Salary: $4,656-$7,584/mo. 43. Travel Portland (Portland Metro) is hiring a Media Relations Coordinator. Salary: DOE. 44. National Psoriasis Foundation (Portland Metro) is hiring a Digital Strategy Manager. Salary: DOE. 47. Adpearance (Portland Metro) is hiring a Communication Analyst Intern. Salary: DOE. 48. Metro (Portland Metro) is hiring a Database Administrator. Salary: $68,744-$92,144/yr. 62. City of Vancouver (Vancouver, WA) is hiring a Multimedia Journalist. Salary: $18.91-$22.47/hr. 65. Oregon College of Oriental Medicine (Portland Metro) is hiring a Systems Administrator. Salary: $50,000-$55,000/yr. 71. First Congregational United Church of Christ (Portland Metro) is hiring a Communications Coordinator. Salary: $31,200-$35,360/yr. 77. Earth Advantage (Portland Metro) is hiring a Project Coordinator. Salary: $16/hr. 82. Adpearance (Portland Metro) is hiring a Communication Analyst Assistant. Salary: DOE. 87. Opus Agency (Portland Metro) is hiring a Senior Project Manager. Salary: DOE. 2. C+C (Portland Metro) is seeking a Public Relations Intern. Salary: $15/hr. 7. XRAY.FM (Portland Metro) is seeking a Sales & Marketing Intern. 8. KBOO Foundation/KBOO Community Radio (Portland Metro) is hiring a Morning News & Public Affairs Director. Salary: $15.11/hr. 47. Portland State University (Portland Metro) is hiring an Audio Visual Event Technician. Salary: $17.50-$25.87/hr. 52. Portland Workforce Alliance (Portland Metro) is hiring a Communications Coordinator. Salary: $15-$20/hr. 56. Medical Teams International (Portland Metro) is hiring a Director of Marketing and Communications. Salary: DOE. 67. Pivot Group LLC (Portland Metro) is hiring a Digital Marketing Specialist. Salary: DOE. 74. Columbia County (Portland Metro) is hiring an Information Technology Manager. Salary: $6,762-$8,594/mo. 87. Graphic Products (Portland Metro) is hiring a Full Stack Web Developer. Salary: $83,000-$93,000/yr. 96. Portland Center Stage (Portland Metro) is hiring an IT Associate. Salary: DOE. 113. PacificSource (Portland Metro) is hiring a Senior Copywriter. Salary: DOE. 114. Milestone Technologies (Bend) is hiring a Data Center Hardware Lab Specialist. Salary: $60,000/yr. 1. Downtown Oregon City Association (Portland Metro) is seeking a Salesforce and Database Intern. There are two positions for a Visual Assistant for DTC 101 and DTC 201. See below for details. Let me know if you plan to apply! This position is on the Vancouver campus. The visual assistant will work directly with a student who is enrolled in Digital Technology & Culture (DTC 101 01) during Fall semester 2016. This position provides direct student accommodations through attending all sessions of DTC 101 01 which meets Mondays, Wednesdays, and Fridays from 10:10am-11:00am which meets in VLIB 201 August 22, 2016 through December 16, 2016. The visual assistant is responsible for communicating important concepts, serves as a note taker, and assists the student with visual components or demands of the class. May also act as a testing scribe. Time commitment: 2.5-7 hours per week. Communicate information to the Access Center coordinator as well as the student. Professional conduct, ability to problem-solve, ability to work independently and in a team, and attention to detail is essential. Previously successfully completed DTC 101. Comfortable with communicating digital technology concepts to another student. Ability to use computers and software, including Microsoft Office programs and web browsers. Student-centered with ability to work with diverse populations, including those with disabilities. Ability to maintain confidentiality and security of student information. Solid customer service philosophy and willingness to work in a diverse team environment. Salary $11.00/hour or current work study rate. Mondays, Wednesdays, and Fridays from 10:10am-11:00am plus additional hours to assist the student with visual components or demands of the class. May also act as a testing scribe. This position is on the Vancouver campus. The visual assistant will work directly with a student who is enrolled in Methods for Digital Technology (DTC 201 01) during Fall semester 2016. This position provides direct student accommodations through attending all sessions of DTC 201 01 which meets Tuesdays and Thursdays from 9:10 am-10:25am which meets in VMMC 111 August 22, 2016 through December 16, 2016. The visual assistant is responsible for communicating important concepts, serves as a note taker, and assists the student with visual components or demands of the class. May also act as a testing scribe. Time commitment: 2.5-7 hours per week. Previously successfully completed DTC 201. Tuesdays and Thursdays from 9:10 am-10:25am plus additional hours to assist the student with visual components or demands of the class. May also act as a testing scribe. 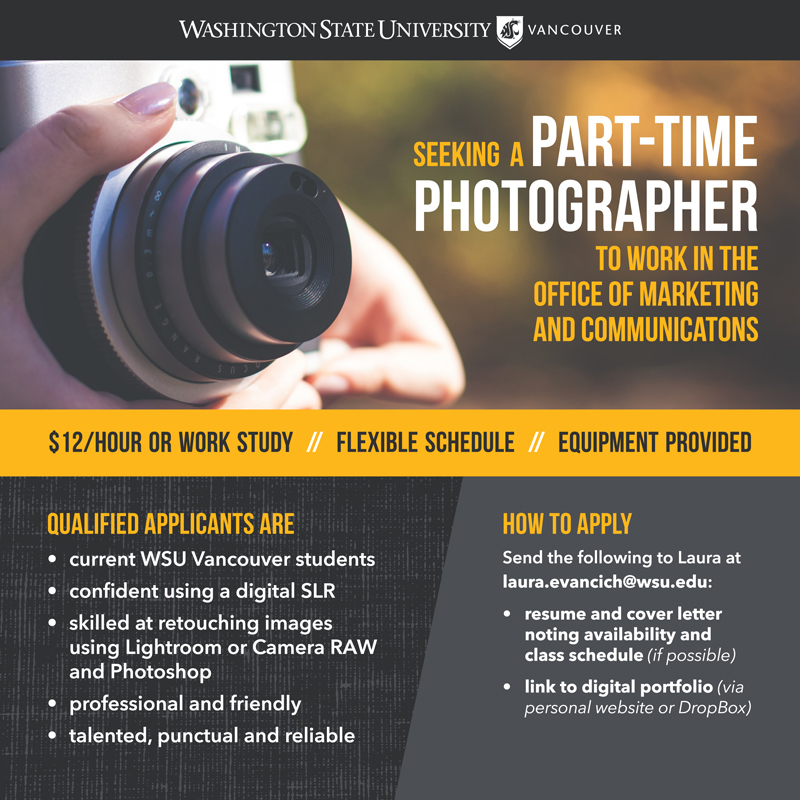 Apply online at CougLink at http://studentaffairs.vancouver.wsu.edu/student-resource-center/career-services and submit cover letter and resume that demonstrates your qualifications for the position to: emma.frieberg@wsu.edu. WSU is an Equal Opportunity/Affirmative Action employers. 18. Community Cycling Center (Portland Metro) is hiring a Communications & Marketing Manager. Salary: $33,000-$41,000/yr. 22. Catlin Gabel School (Portland Metro) is hiring a Graphic Designer. Salary: DOE. 40. Oregon College of Art and Craft (Portland Metro) is hiring a Communications Manager. Salary: DOE. 47. OSC, Enrollment Team (Portland Metro) is hiring a Information Systems Tech. Salary: $3,702-$5,469/mo. 64. Washington State Universtiy Vancouver (Portland Metro) is hiring a Campus Director for Equity and Diversity. Salary: DOE. 67. OPB (Portland Metro) is hiring an Education Reporter/Producer. Salary: DOE. 78. Apsalar (Remote Work / Telework) is hiring a Full Stack Engineer. Salary: DOE. 84. People’s Food Co-op (Portland Metro) is hiring a Design Manager. Salary: $13/hr. 3. XRAY.FM (Portland Metro) is seeking a Sales & Marketing Intern. 4. Bridge Advantage (Portland Metro) is seeking a Marketing Coordinator Intern. Stipend. 1. University of Western States (Portland Metro) is hiring a Content Strategist. Salary: $45,000-$50,000/yr. 16. Oregon Tilth (Corvallis) is hiring a Communications Program Assistant. Salary: DOE. 30. SecureWorld (Portland Metro) is hiring an Associate Email Marketing Analyst. Salary: DOE. 39. Adpearance (Portland Metro) is hiring a Marketing Specialist. Salary: DOE. 41. Powell’s Books (Portland Metro) is hiring a Director of Information Technology. Salary: DOE. 51. OregonASK (Portland Metro) is hiring a Technology /Communications Coordinator. Salary: DOE. 62. Cascade Insights (Portland Metro) is hiring an Email Prospecting. Salary: $35,000-$60,000/yr. 66. Oregon Food Bank (Portland Metro) is hiring a Donor Database Assistant. Salary: $16.64/hr. 73. Oregon Episcopal School (Portland Metro) is hiring a Summer Program Instructor – Digital Photography, Stop Motion Animation, Movie Making. Salary: $50/hr. 1. Bridge Advantage (Portland Metro) is seeking a Marketing Coordinator Intern. Salary: DOE.